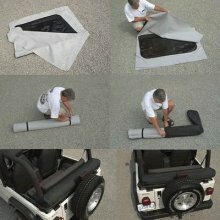 Check out our review of the Window Roll on Jeepin.com! Clover Patch has created an exciting new product that enables owners of Jeep Wrangler (87-06) vehicles (including the Unlimited) to store their quarter windows and the rear window with metal bar, on board, through the use of the Window Roll. Remember those times when you left your windows in and they were ripped on the trail? Or, how about the time you had them lying in the back, forgot about them and lost one, or your buddy put his foot through one? With the top up or down, the Window Roll enables you to safely store and protect 3 windows without giving up valuable vehicle space. If the weather turns bad, your windows are easily accessible. The bag is made of an outer layer of nylon with a "strap and buckle" system that secures to the rear roll bar. 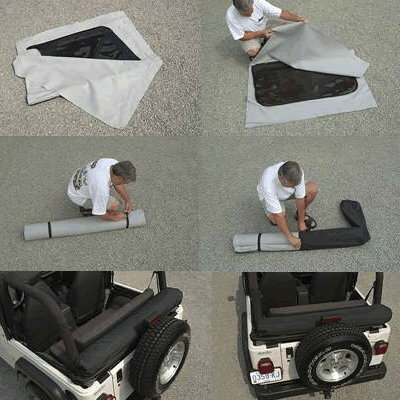 The windows are rolled between layers of soft felt, inserted into the bag, attached to the roll bar and AWAY YOU ROLL! The nylon bag is water resistant and coated to prevent dirt/dust from getting on the felt liner. It is also easily washed and dries quickly. All CloverPatch products are made in the U.S.A., including the Convert-A-Top. 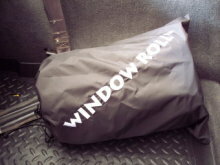 The Window Roll is designed to keep your vinyl windows safely on-board and readily accessible. Clover Patch takes great pride in the Window Roll. This includes the manufacturing process and customer service. This product carries a 90 day limited warranty on parts and workmanship.